Avoid the Congestion ... Park in the Garage! While there is a small outdoor parking area in front of our clinic, the area can become quite crowded during peak hours. We recommend parking at the FREE Covered Parking Garage with the entrance located at Lake Merced Blvd (where Wingstop is). The parking garage has over 600 SPACES available, and is rarely full on the 1st or 2nd floors (the garage has 5+ floors). In fact, many employees park here to avoid the parking area outside and the garage is regularly patrolled by security. 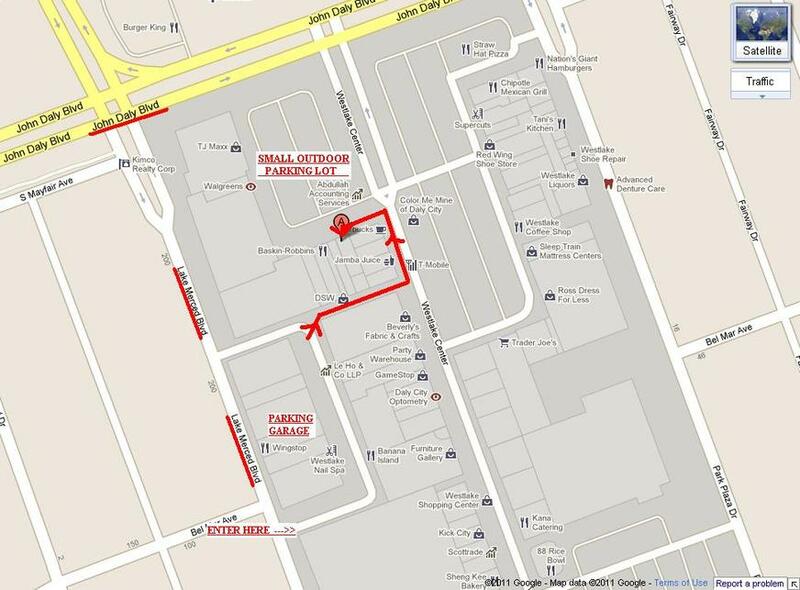 After parking, our office is a short walk away from the garage. Please take the elevators/stairs down towards the back of DSW shoes NOT the Home Depot side. Then, follow the walkway, and make a LEFT when you see Hella Halal. Afterward, make another LEFT when you see Starbucks and you will see our office. Thank you for taking the time to see us!